Celebrate With The National Champs This Weekend! 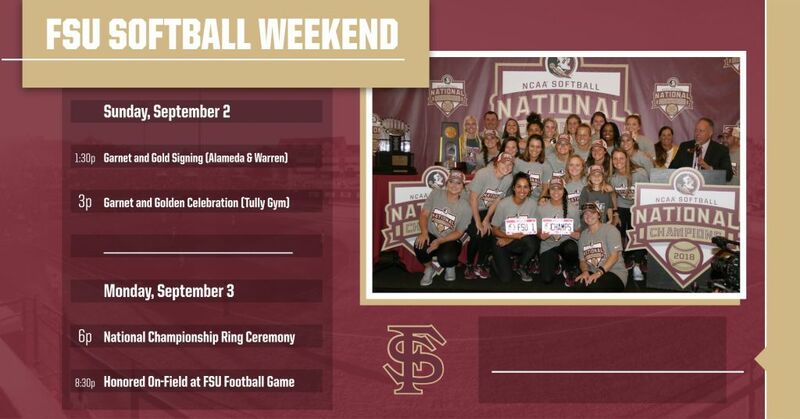 TALLAHASSEE, Fla. — After bringing home the program’s first NCAA National Championship this season, FSU Softball will be taking part in numerous events throughout Tallahassee this weekend to celebrate the title. On Sunday, September 2, head coach Lonni Alameda and three-time NFCA All-American Jessie Warren will be at the Garnet and Gold campus location for an autograph signing from 1:30-2:30 p.m. Alameda has earned ACC Coach of the Year honors five times in her 10 years at Florida State, while Warren ended her career as a Seminole ranked eighth in NCAA history with 83 home runs and 273 RBI. At 3:00 p.m., all Seminole fans are encouraged to come to Tully Gym to help Florida State formally kick of the Garnet and Golden Celebration to honor the 50th anniversary of women’s athletics at FSU. There will be numerous speakers and presentations and celebrations of all of the great accomplishments and success from Seminole women over the last 50 years. On Monday, September 3, FSU Softball will present “Team 35” with their National Championship rings at a ceremony on the second floor of the batting cages beginning at 6pm. There will be a few speakers and an opportunity for photos to be taken with the National Championship trophy. The event costs $15 dollars and entrance will be near the batting cages between softball and baseball. Following the ring ceremony, the team and staff will head over to Doak Campbell Stadium for the Florida State/Virginia Tech football game. The entire team will be recognized on the field during the break after the first quarter. The 2018 fall schedule for FSU softball will be released soon for fans that are interested in seeing Team 36 in action.